ValleyCrest Landscape Cos. has been named a Supplier of Distinction by professional services and investment management firm Jones Lang LaSalle. The award recognizes suppliers that have played vital roles in elevating the firm’s ability to deliver the highest caliber of service, value and innovation to its corporate clients. Jones Lang LaSalle recognizes six suppliers each year in award categories that reflect areas considered the most critical to addressing its clients’ business objectives. 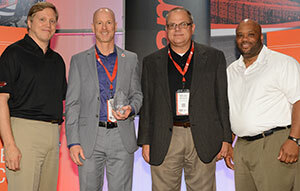 ValleyCrest was the winner of the Innovation category, a distinction that recognizes the development of breakthrough processes, tools and service models. It was selected for the award because it consistently demonstrated the ability to think through complex water management and sustainability objectives of Jones Lang LaSalle’s customers to achieve their goals of conservation and cost savings. Jones Lang LaSalle’s Global Strategic Sourcing Board selected award recipients from a pool of hundreds of supplier partners. All participants support Corporate Solutions or Project and Development Services functions across multiple regions for Jones Lang LaSalle corporate clients.